Brittany Taylor, a simple living backpacker, will soon begin to travel in her 19-foot restored Toyota Winnebago Micro Warrior motorhome. Anyone interested in simple living and minimalism may have seen the YouTube videos by Brittany Taylor. 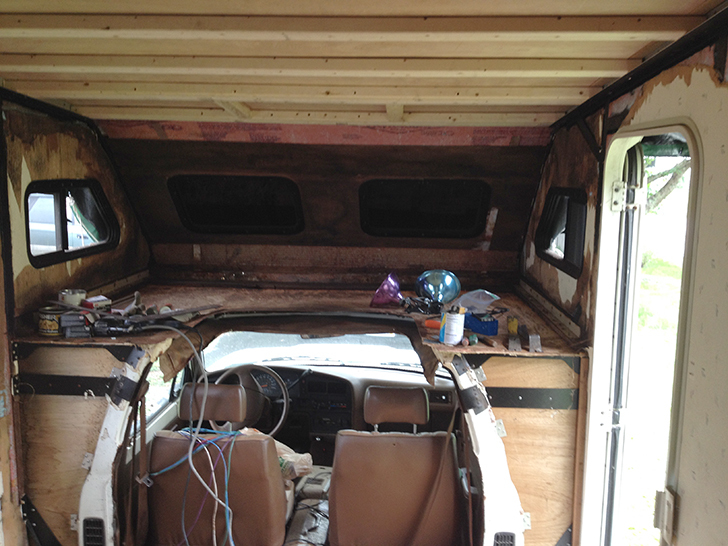 This spunky young woman has not only traveled the world with a small backpack, but she is now in the process of restoring a 1990 Toyota Winnebago Micro Warrior. 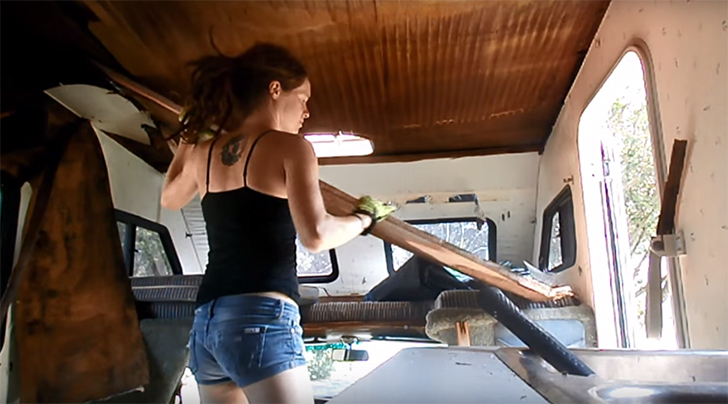 While she’s known for her amazing AcroYoga poses, Brittany also has some carpentry chops. 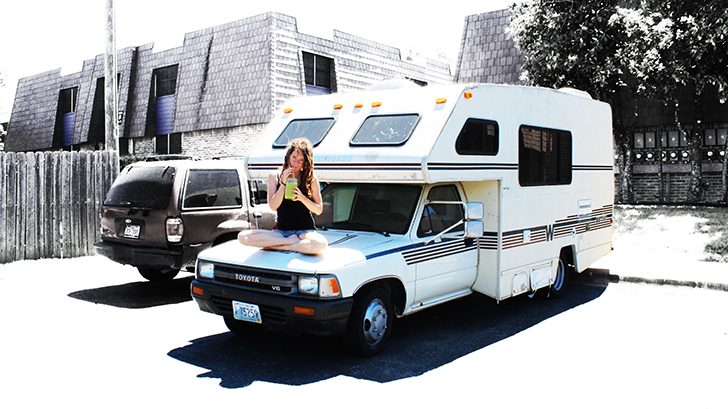 Brittany Taylor of Simple Living and Travel plans on traveling in her 1990 Micro Warrior. 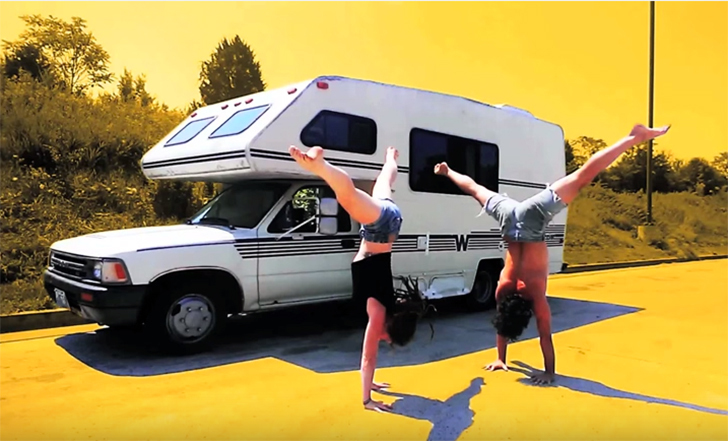 Her website, Simple Living and Travel, documents her life on the road and now her camper, Winnie, has a video channel where Brittany and Conor McMillen of Thriving Minimalist cover the step-by-step process of converting and moving into a 19-foot long RV. 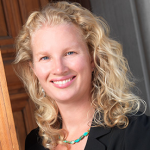 From a young age, Brittany has been interested in RVs and took camping trips with her father since the age of 5. Those early travels in the family camper gave her the initial travel bug. Brittany has spent the last few years living out of a small backpack. I was drawn to the simple life the RV encouraged. We didn’t have many items with us, but our lives were full of love and abundance in all the areas that truly mattered to me. I enjoyed the adventure of travel, the excitement of waking up in a new place each day; I loved meeting new people and learning about different ways of living. She found Winnie on a Rhode Island Craigslist and purchased her for only $2,000. 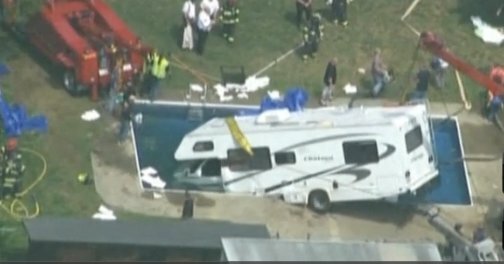 The camper had some water damage, but a well-maintained V6 engine. 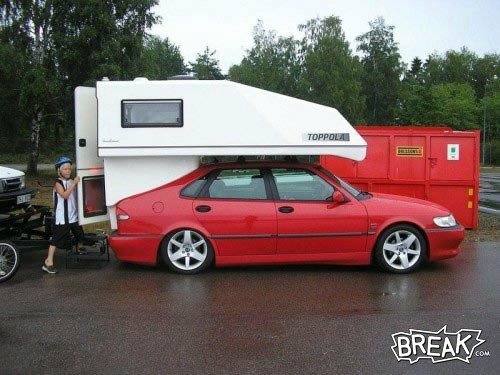 When looking for her own RV, Brittany wanted to stick with a camper rather than a trailer (to avoid purchasing an additional vehicle) and she wanted a full bathroom. 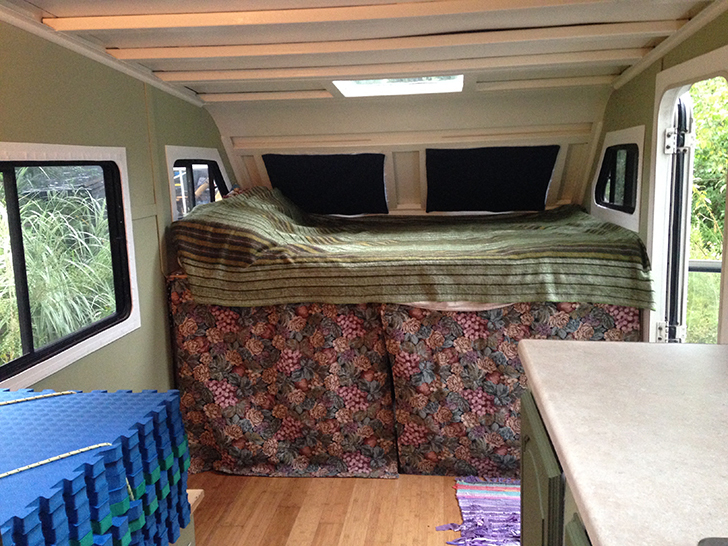 She gutted and restored the 19-foot camper with help from friends and family. It also would be ideal to get great gas mileage because I planned to take to the road frequently, which made a Toyota camper a clear winner. 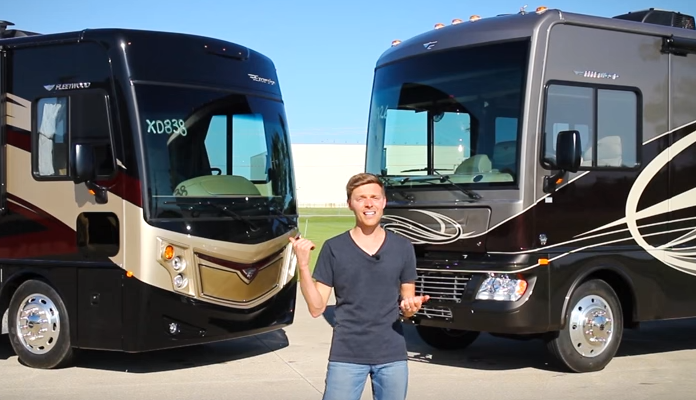 Renovating my own RV was never a question in my mind—I knew I would want to basically gut one and customize it completely, leaving as much open space as possible. I often dreamed of what I would do if I had my own small space to live in and it was exciting to finally make that a reality. Brittany took everything out of the camper including the chairs, table, sofa, cabinets, air conditioner, stove and oven, carpet and wallpaper, and yes, even the bathroom sink. 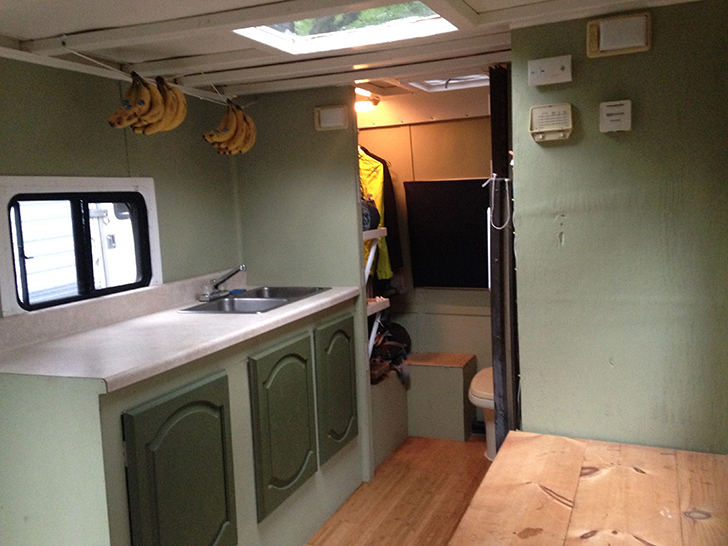 She has reinforced the roof, put in a new floor, new walls and built a custom countertop with cabinets and sink space. 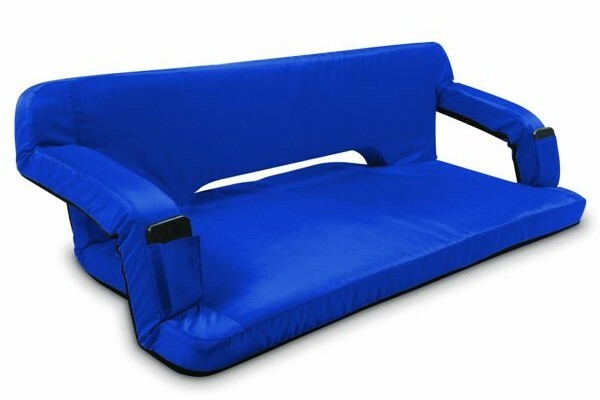 She also has a custom water tank compartment that holds the electric panel and doubles as a seat. 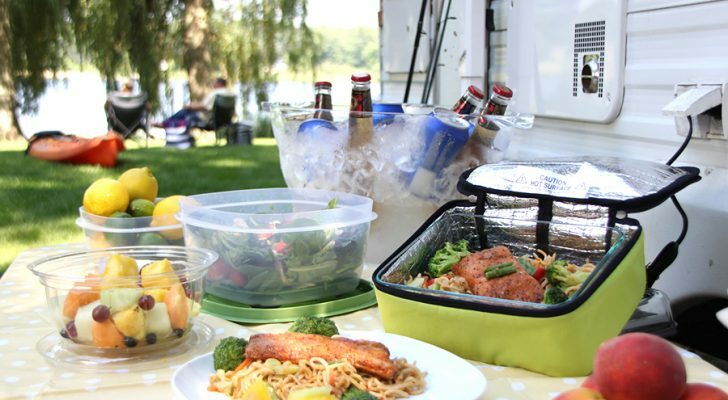 She also plans to customize the closet near the camper toilet, install LED lights, build a cabinet above the refrigerator to house an inverter for the future solar panels, and install a bike rack and spare tire holder. 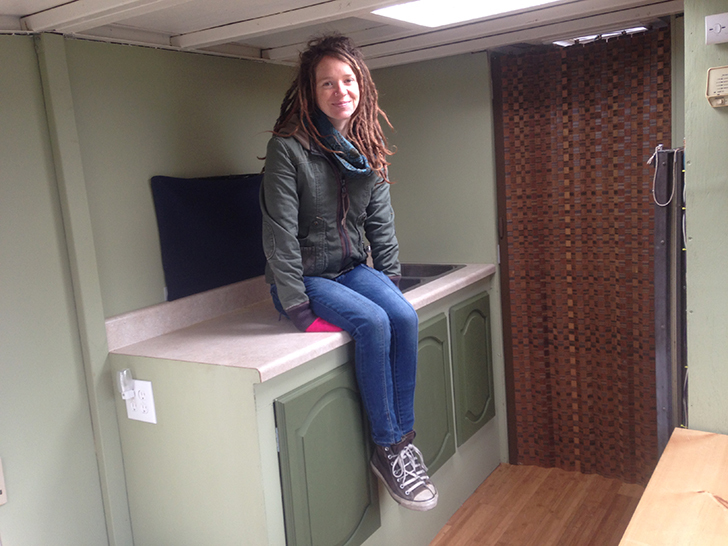 Brittany eats a vegan and raw food diet and plans to create spaces in the RV for fruit and vegetable storage. So far her favorite project was putting in the bamboo floor. Her sister gave her a hand and Brittany said it went in quickly, even with her limited knowledge. 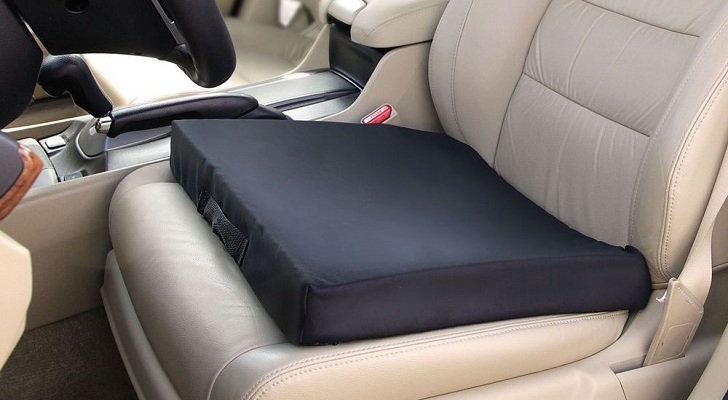 It was super satisfying because everything fits together nicely and once it’s down it’s finished. We also shared a lot of laughs and just generally enjoyed being self-sufficient goofballs together. 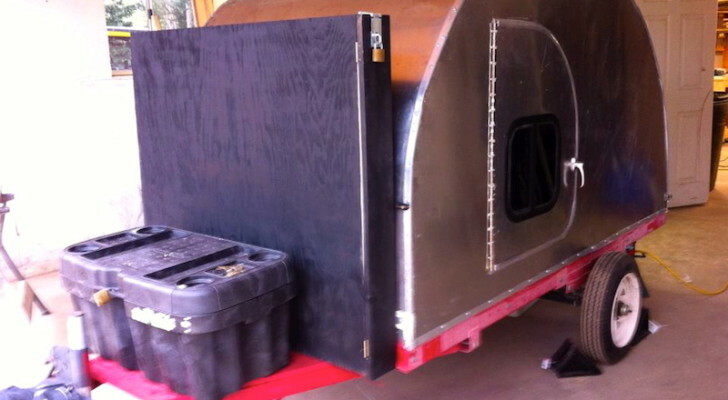 Her not-so-favorite project was building a new compartment for the water tank and electrical box. 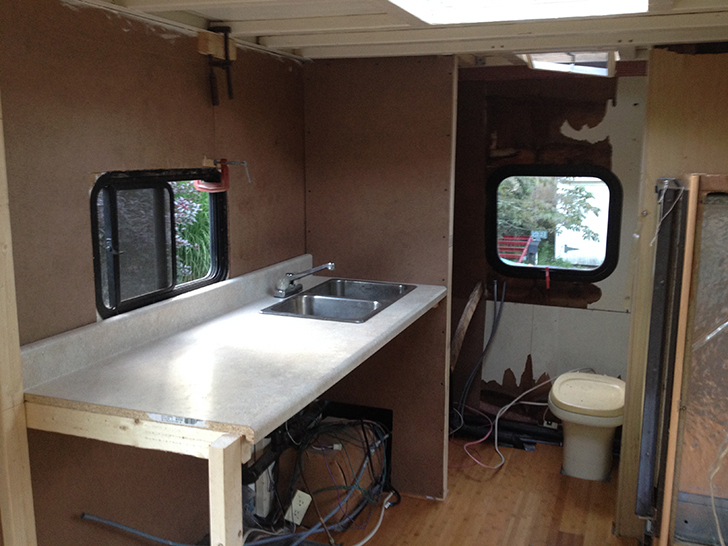 Working in a small space over the wheel well and creating space for plumbing and electrical was a challenge. There were definitely elements of it I enjoyed, but after nearly a week of re-plumbing, building, and trips upon trips to Home Depot and the RV store, I was thrilled to have the job completed. 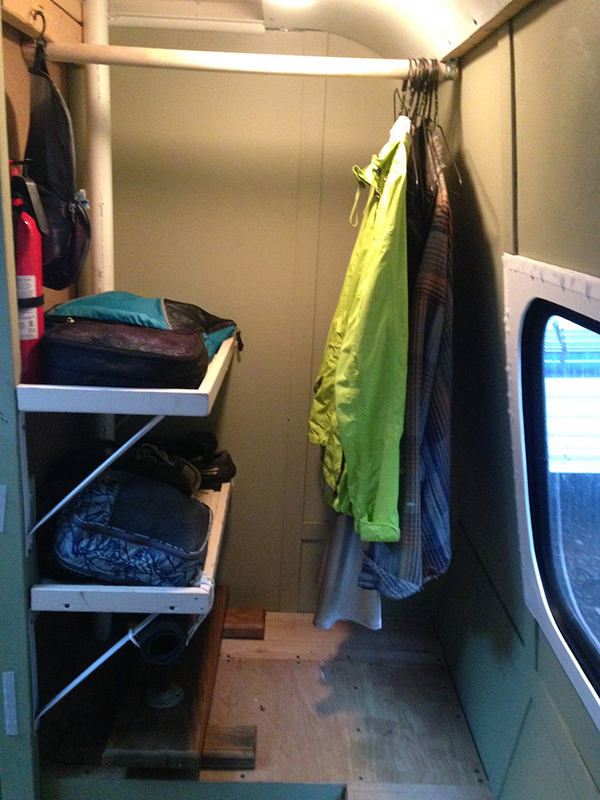 Brittany is looking forward to customizing the small RV closet. Brittany is thrilled with the satisfaction that comes with doing her own work on the camper. She also outsources jobs that don’t interest her (like vehicle maintenance) to friends or family. I am really digging working on Winnie these days because she’s finished enough that I’m getting into fun custom creations in the interior spaces, like building the storage spaces just as I want, making hidden compartments and fold-down nightstands. It feels like such a treat to be able to explore my creativity in this functional, satisfying way to a space I call home. Brittany and her friend Conor practicing yoga with Winnie. 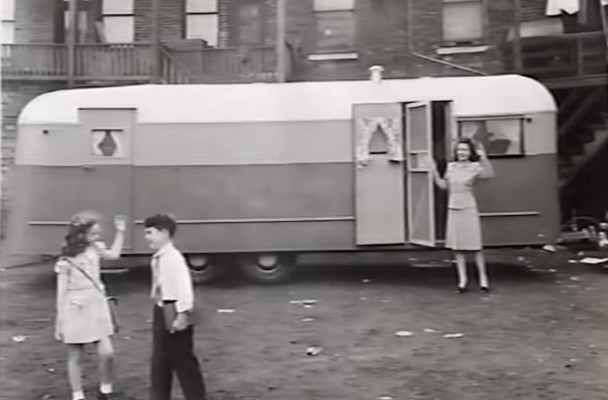 Watch This Interesting Documentary On Trailer Life In The Mid-20th Century. Lots Of Fascinating Interviews.